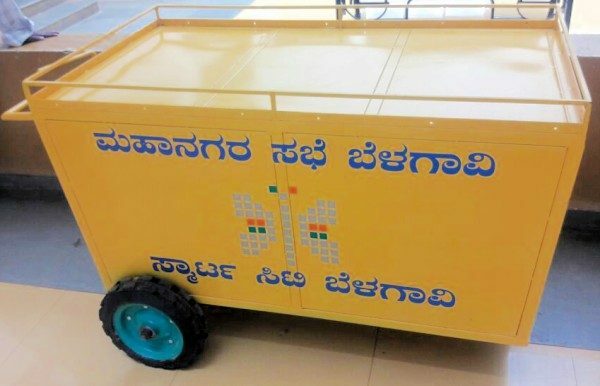 The hawkers in Belagavi city will get new carts which will have their name, location and number mentioned and they will have to keep this cart in the pre identified location only in the Hawker zone identified by the Belagavi city corporation. The corporation has just received one cart of the hundreds such ordered worth 1 crore which will be given free of cost to the Hawkers who will be identified by the corporation. The cart also has the Smart city logo and will have the name of the Hawker, his registration number and location where it has to be kept. A Hawkers zone behind Kaveri Cold drink and Chitra Theater has been planned and the same is likely to be executed in coming months. This new cart even though which is smaller than the regular cart but will have storage facility and can be locked. In the first phase hawkers from Khade Bazar, Ganpat Galli and Maruti Galli will be properly identified and then will be alloted such new carts.